The disasters of March 2011 in Japan (東日本大震災, or Great East Japan Earthquake) were multiple: a massive earthquake that struck northeastern Japan (the Tōhoku region), the resulting tsunami that inundated coastal towns and cities, and the meltdown of a reactor in Fukushima. The disasters didn’t affect only Tōhoku, as residents of Tokyo experienced electricity blackouts, and throughout Japan there were concerns about tainted food. Of course, beyond these concerns in daily life, Japanese across the country were directly related to those who lost their lives, homes, and livelihoods in the disaster zone, and many volunteered their help in the aftermath. 3. To serve as a site of shared memory for those most affected by these events and most concerned about their consequences. While a postdoctoral fellow in the Reischauer Institute, I worked as the Archive Development Manager on the JDArchive from 2012-2013. In this capacity, I facilitated connections with partners and their materials, a role in which I served as a project manager, a liaison, and a technical and metadata specialist. Here I will address the types of materials that the archive indexes for searching, how to use the search engine, and how to participate in the archive’s further development. The JDArchive, as already noted, contains no items itself aside from tweets. Rather, it creates a central place to search, via indexed metadata, partner digital archives’ content. Partners include a number of organizations in Japan in addition to the Internet Archive, such as Tōhoku University, the Asahi Shimbun, the National Diet Library of Japan, NHK, the National Institute of Informatics, and Yahoo! JAPAN. The contents of these partners’ archives are extensive: the JDArchive has indexed some 1.4 million items, including approximately 600,000 tweets from the Hypercities project. Other data types range from images to newspaper articles and headlines, videos, and archived websites. One type of item that stands out is testimonials, or the personal experiences of individuals impacted by the disasters, submitted by the people themselves to the JDArchive. Although the JDArchive interface is available in both Japanese and English, the contents of the archive are mixed and are generally not in both languages. Researchers can use the archive in either language or both. It is intended for language learners, undergraduate and graduate students, scholars, and citizens. The digital archive is meant to support their teaching and research as well as community building and activism, and also simply as a means for learning more about the disasters and their aftermath. The items are available to search via both basic and advanced interfaces. Users can limit their search by formats or simply exclude all tweets or even just re-tweets from searches. In an advanced search, users can also specifically exclude some words from their searches; they can also limit by start and end date, and geographic region via a map for those items that have GIS data. It also allows for Boolean searching, meaning the use of AND and OR to focus searches. Users can search either in Japanese or English. However, because many items are tagged only in one language or are missing tags, searching in only one language will not retrieve all results relevant to users’ research. For example, “Fukushima” and “福島” retrieve different results. Try some creative searching to get all of the results relevant to you, or alternatively, search only for terms in the target language if you wish to limit to either English or Japanese, since searching by language is not an option (this is not a type of metadata collected by the archive). It is important to note that not all items include all types of metadata: some may be missing tags, while others might be missing dates or a description. Take this limitation into consideration when forming and limiting searches and consider performing multiple searches to obtain all of the items relevant to your research question. While search results are displayed as a list by default, users can also map their results using technology developed by the Harvard Center for Geographic Analysis. One unique aspect of the JDArchive is its invitation for users to participate directly in the curating and content of the archive itself. The archive invites users to create “collections,” which are akin to curated exhibits. Users can choose their own themes, such as topics, people, or locations, and add items from the archive to their collections. Then, users can choose to make them either private or public, potentially sharing these value-added collections with others. In addition, the JDArchive has a crowdsourcing aspect: it allows users to submit translations of any item into any language and even edit each other’s translations. Although not many users have submitted these so far, the archive is actively soliciting translations and aims to gather as many as possible to enhance the archive for various languages. Users can contribute to the archive in other ways as well. The JDArchive actively solicits users’ testimonials as well as suggested websites for the collection, which can be submitted through a form on the website. In addition, the archive is interested in connecting with even more partners and welcomes contacts and suggestions of groups in Japan and beyond that would be interested in adding their information to the site. Please visit jdarchive.org to submit your suggestions and comments. 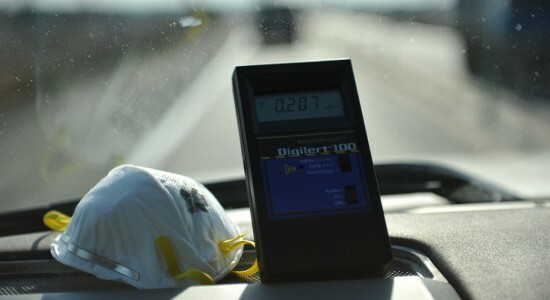 Image: Photograph of a a radiation counter in the earthquake/tsunami zone by William Saito, licensed under Creative Commons Attribution-Non Commercial-No Derivatives license.